Has a degree in Creative Writing from the University of Wollongong. Lives in Sydney. 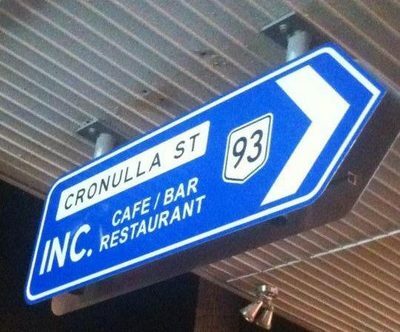 If you're looking for an edgy, funky place to eat or chug a cuppa, jump into Inc. Café & Restaurant at 93 Cronulla St. Cronulla NSW 2230. When visualising the café's design, Peter Poulos wanted "old school rockabilly tattoos" with an "urban back alley" feel – and it's definitely the look that makes this café special. Hanging from the awning outside is an arrow road-sign boasting its name. As you're walking in, you're drenched in the gothic punk-rock décor: zebra print chairs, bejeweled chandeliers and a spray-painted freedom wall. Dungeon windows are cut into the opposite bare-brick wall and lit by melted candles. Brick barriers segment the café and a thin jail-bar window peeps into the kitchen. To top it off, a table in a crusty cage is available for you and your animals – ah hem, friends – to roost at while live music keeps your toes tapping. And, if your friends get boring, there's a big screen TV that you can watch while you nod automatically. The grub available is modern Australian and Mediterranean food. The menu is swarming with dishes such as pizza, seafood, salads, Angus beef and vegetarian cuisine. Beverages include coffee of course and also tea, juice and thickshakes – the chocolate thickshake is especially delicious. They have a range of gluten free foods including pizza bases as well as vegan and vegetarian items. The price ranges are: Lunch $10-$17, Dinner $16-$24, Dessert $8-$10, Coffee $3 and Milkshakes/Thickshakes about $6. The staff enrich the theme with spunky haircuts and alternative looks. Their uniforms are jet-black and their demeanor is friendly. A mishap this reviewer found was that a dessert was unavailable and this was not mentioned until after a fifteen minute waiting time – in fact after one waitperson cited this, another came almost ten minutes later with the same message. Also, the crepes were crunchy instead of soft and supple. One can still have a good time at Inc. Café, though its atmospheric experience is seemingly stronger than its food and service quality. Inc. Café does breakfast, lunch and dinner. Opening hours are: Mondays 11am to 10:30pm, Tuesdays to Thursdays 8am to 10:30pm, Friday to Saturday 8am to Midnight and Sunday 8am to 11pm. The café is located along a strip of restaurants with inside and outside seating. Despite the passing pedestrians and cars, if you're sitting inside, it's quiet. Parking at Cronulla can be difficult, particularly on Friday and Saturday nights, so while there is street-side parking, also try parking near the beach or the multi-level on Croydon Street. Or, Cronulla train station, with a bus stop outside the front, is very close so the train or bus could be a great no-fuss alternative. To complete the dining experience, Inc. Café and Restaurant is conveniently only a short walk from Cronulla Beach. What's better after a nice supper than a leisurely stroll along the beach, the wind tussling your hair as you walk off your meal?